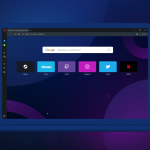 Today, we are releasing an update to Opera 21 which contains a few critical fixes. Opera on Mac had a bug where the Speed Dial could go into an unclickable state, and some of you were having problems loading Speed Dial thumbnails. We have fixed these issues now. Thanks to all your feedback and reports. Or go here for online installation: Opera Network Installer.